Redefining the Face Of Beauty : SAFETY PRECAUTIONS-NAIL SALONS! In order to protect yourself from these infections always do a quick look at the salon upon entering. Make sure that the salon has things properly stored away, this includes nail polish and other sanitary products. Also, the nail technicians should be changing towels and washing the utensils after each session. Be aware if you have personal allergies as well. Most of the time these things are hard to capture within just a glimpse of walking into a nail salon, this is why it is imperative to do your homework prior to going to a nail salon. For example, ask around or search the internet for ratings on the salon that you choose to attend. For your convenience, check out the additional information about nail health care. HUFFINGTON POST, 5 DANGERS AWAITING YOU AT THE SALON! DR. OZ SHOW, INVESTIGATES NAIL SALONS & THE DANGERS! HEALTH HAZARDS IN NAIL SALONS! OSHA! 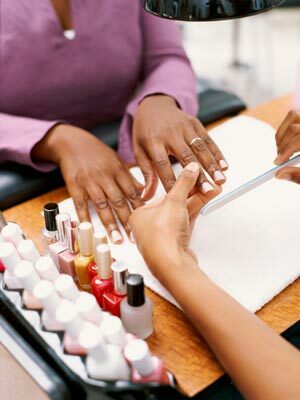 6 SIGNS OF A CLEAN NAIL SALON! "And be kind to one another, tenderhearted, forgiving one another even as God for Christ's sake hath forgiven you - Ephesians 4:32)."